As Heston Blumenthal’s christmas pudding at Waitrose has sold out early this year, we have taken it upon ourselves to bring you a our take on a Christmas Pudding Reciepe with obiously a twist of Cocoa in the ingredients! 1. Roughly chop the prunes, put into a bowl then pour over the brandy. Cover and leave overnight. 2. Grease 4 pudding basins and prepare a large steamer. 3. Sift the flour, cocoa and baking powder into a bowl, stir in the sugar. 5. Spoon the mixture into the four pudding basins. Cover with greased foil and tuck the edges of foil tightly around the basins. Place in the steamer and steam for 30 mins. 6. 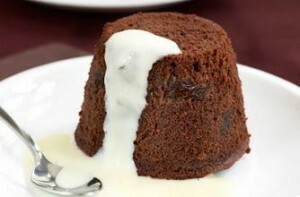 To turn out, run a small palette knife round the edge of the puddings, invert onto plates and serve with vanilla custard. Chocolate is one of the good things in life. Whether you like a sophisticated square of your favourite 70% cacao bar to give you a boost in the afternoon, or something altogether more indulgent like a sumptuous gateaux or creamy mousse, good chocolate is a pleasure not to be missed. 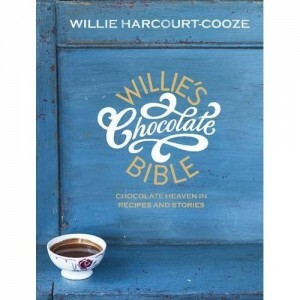 And who better to help you indulge your passion than the irrepressible Willie Harcourt Cooze, who brings all his knowledge together with over 150 of his very best chocolate recipes to create the ultimate chocolate bible. Essential reading for chocolate lovers everywhere, this book contains all the classic recipes, from chocolate panna cotta and dark chocolate tart to pain au chocolate and ice cream. Sourced from the Island of Java, these bars are made from a highly prized strain of cacao. The beans are visually striking as they are exceptionally light in colour and they have a slightly higher cacao butter content than usual. This makes them highly prized by chocolate manufacturers, particularly in the use of milk chocolate. The beans produce a bar with light caramel notes. With 572,000 metric tons of cocoa beans produced, Indonesia is the third world biggest producer of cocoa after Ivory Coast and Ghana. Indonesian Cocoa export are currently valued at approximately $600-700 million per year and provide the main source of income and livelihood for over 400,000 smallholder farmers and their families. 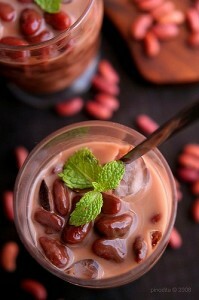 We have added the Recipe of a Traditional Indonesian Desert for you to try with the new Cocao here ! 1. Boil water, chocolate condensed milk, sugar and cocoa powder. 2. Add boiled red beans, bring to a boil. Remove from heat. 3. Serve with ice or vanilla ice cream (better serve the next day). Look Out Folks . The Paper Back Version of Willie’s Chocolate Factory Cookbook is coming to store on the 4th March! Willie Harcourt-Cooze was born in London on April 29, 1964 to an Irish mother and a Burmese father. He was the third of five children, surrounded by four sisters.While on holiday in Ireland, his father, William, fell in love with and bought the deserted Horse Island on a wild stretch of Ireland’s south west coast. The family moved to live there when Willie was four. In a farmhouse between Ballydehob and Schull Willie spent his childhood making cheese, smoking fish, milling flour, growing vegetables and pickling fruit. Willie was reeling in sea trout almost before he could walk, so it is not surprising that his passion for food survived and thrived into adulthood. Willie returned to London at 15 and at 18 left home for a series of swashbuckling adventures and tastes; from the feral meats of the Australian outback to the native dishes of Peru, via a feast of exotic delicacies throughout the Far East. He charmed his way onto fishing boats and into local kitchens and devoured a multitude of culinary secrets. While in Venezuela on holiday in 1993 with his wife, Tania, Willie met a traveler who told him of a place “where the mountain meets the sea”. They headed for this remote coastal area near Choroni. Having fallen for the area, one day a beach umbrella seller told them of a hacienda in the cloud forest for sale. They went to investigate in the Henri Pittier National Park, where 1800 metre mountains steep into the Caribbean Sea. That was Willie’s first introduction to the cacao tree. The owner changed his mind, but three years later, after returning to London and almost giving up hope, Willie was able buy Hacienda El Tesoro in 1996. He quickly discovered his passion for chocolate and began experimenting with making cacao bars. Ten years later he had carved himself into the land, which is renowned for having some of the finest beans in the world. Willie and Tania’s first two children, Sophia and William were born in Venezuela.Their third Eve arrived when the family had moved to Devon as Willie sought to set up a chocolate factory. He began collecting original chocolate making machinery from around the world. Willie started producing his first single origin 100% cylinders in the factory in Devon in 2007. 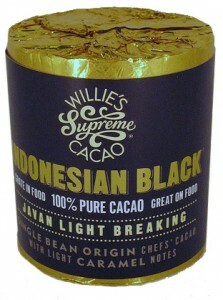 They were an instant hit and a year later Willie added to them with his first single origin chocolate bars. The misconception people have about it being bad for them is because of the sugar content.